Sowing two varieties with different days to maturity (DTM,) each in their own garden area. 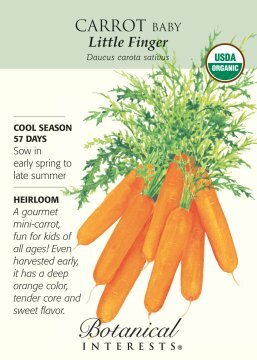 This method is particularly helpful for crops you harvest only once (e.g., carrots, radish, corn). 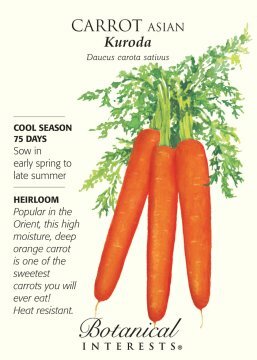 For example, Botanical Interests’ Baby Little Finger Carrots (57 DTM) can be sown in a different area but at the same time as their Asian Kuroda Carrots (75 DTM), producing two harvests, about 2 weeks apart, with one planting effort. (See the pictures). By sowing radishes (30 DTM) with beets (60 DTM), you can harvest the early radishes, while at the same time allowing beets room to mature. We have dozens of Botanical Interests seed varieties available in our Garden Center that are perfect for successive sowing! Stop by and browse our full selection!